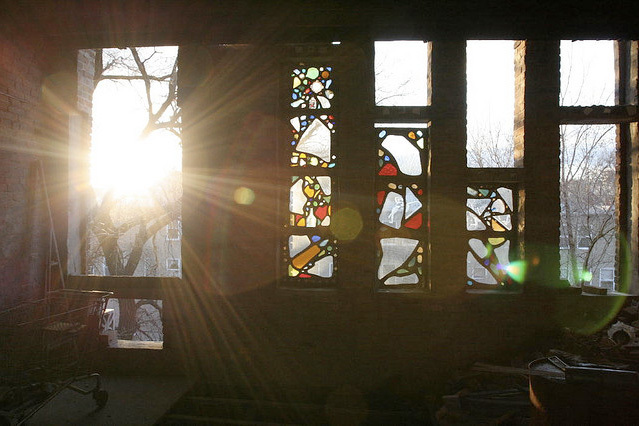 Most of the coverage you’ll find about the Broken Angel House, a handmade architectural marvel in Clinton Hill, starts the story in 2006, when there was a small fire that set off all the trouble. That’s the year the tale switches from one about brilliant bohemian artists building their crazy dream house to one about an eccentric old man overwhelmed by legal troubles, shady business partners, and the strangling bureaucracy of the city. Arthur Wood has been likened to an American Gaudí. 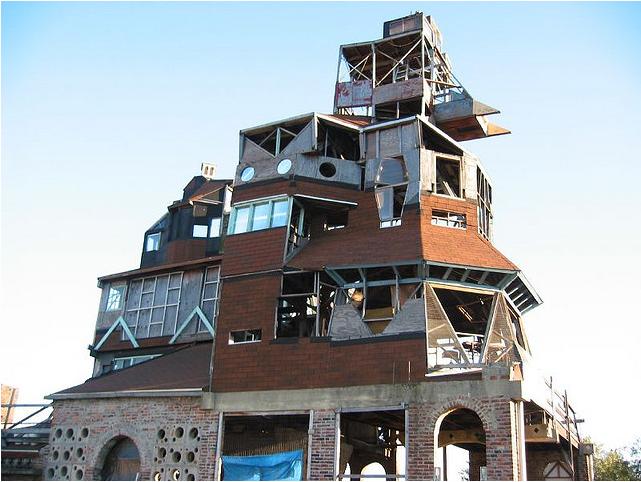 The Broken Angel House has been compared to LA’s Watts Towers and Austin’s Cathedral of Junk. Borough President Marty Markowitz called it “a Rubik’s Cube of a spaceship.” It’s been termed vernacular architecture, folk art, outsider art, and — naturally, by some — a frightening eyesore. In its heyday, the Broken Angel was one of the most strikingly unique sculptural works in all of New York. Tragically, much of it has been dismantled in the past decade, and what’s left is not likely to last much longer. 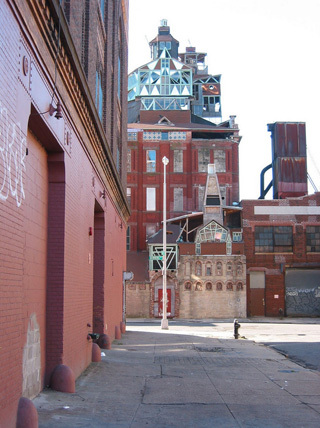 Wood (who is now 84) and his wife, Cynthia (who passed away in 2010), bought the former Brooklyn Trolley headquarters at a city auction in 1979. They paid a mere $2,000 for the four-story, 10,000-square-foot building. And then they began to turn it into art. 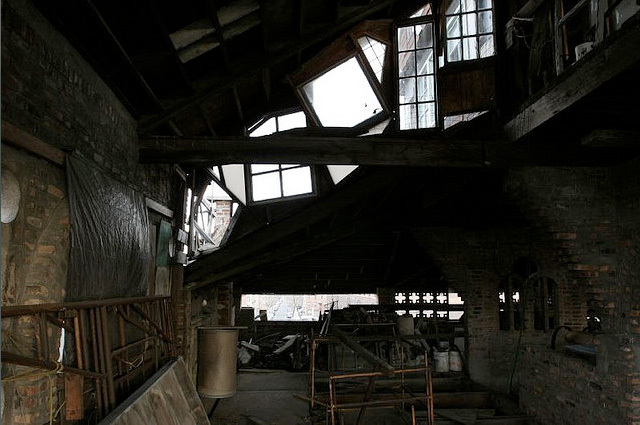 The roof structure branched into two towers. The front one had a huge camera obscura, which gave a 360-degree view of the neighborhood (seven flights up!). You could see blocks and blocks in great detail on a huge white linoleum table scavenged from the street. There was a sweet wooden deck up there, too, for stargazing (Arthur loves inventing star-gazing equipment) or hanging out or making art. The back tower was a cool sculpture; you couldn’t hang out on it so much, but you could tangle yourself in its branches (I use the term “branches” metaphorically). In the back there was also another deck that was all stucco — it was like being in the Southwest US. The house was an amalgam of all kinds of amazing environments! In 2004, Michel Gondry used the Broken Angel as the backdrop for Dave Chappelle’s Block Party. 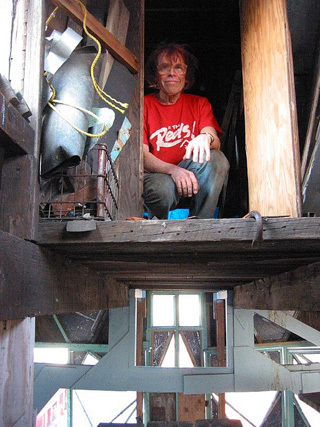 “Arthur’s sparkling ideas were built with other people’s trash,” wrote Brandon Stanton from Humans of New York in 2011. “The concepts were towering and glistening. The realities were made of plywood.” The Broken Angel represents the kind of treasure that revitalizes your excitement about your neighborhood, that renews your faith in art triumphing over everything — up to and including reason. And then in 2006 there was a fire. It was small, on one of the top turrets. There was minimal damage and no one was hurt, but that was the point when things began to go downhill. The firefighters on the scene deemed the building unsafe to enter, and the Department of Buildings was notified. The department immediately ruled the place unfit for occupancy and evicted the Woods, who were arrested a few days later when they refused to leave. To bring the building up to code — including tearing down the forty feet of additional structure on the roof — would cost around $3 million. The community rallied around the Woods, including Pratt architecture professor Brent M. Porter, who, along with seven of his students, tried to prove that the building was, in fact, structurally sound. 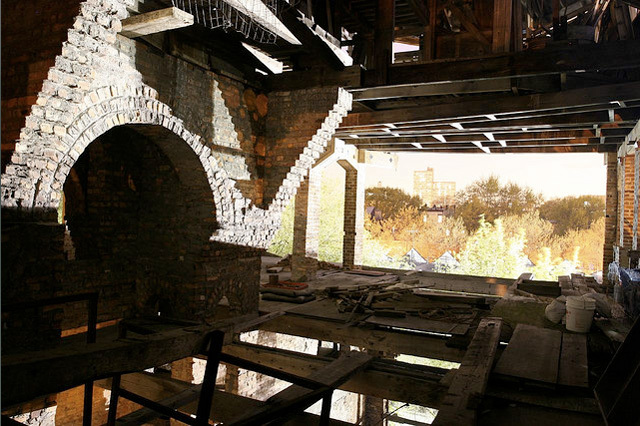 When that didn’t work, the Woods partnered with real estate developer Shahn Anderson to bring it up to code and convert it into condos and art studios. 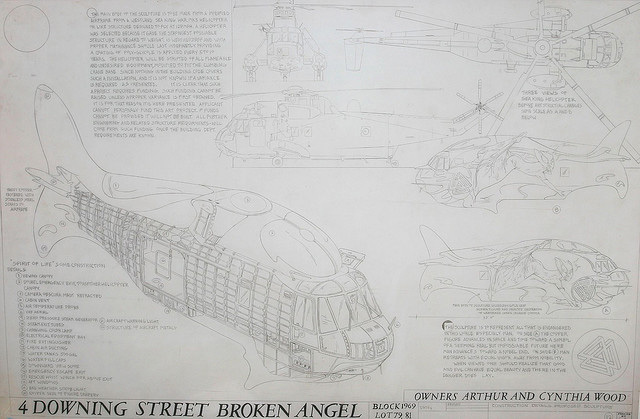 This (early 2007) was a hopeful moment: it seemed like Arthur’s full vision for the Broken Angel would finally be realized, saving the fantastical space and even opening it up to artists and the community. The building was [going to be] transformed into a “museum of light” as he termed it … There was to be a parabolic dish in the cellar where light from a prism in the then existing cupola would be directed … There was to be the “cathedral of light” in the front addition where schoolchildren would come to play with interactive exhibits in light, and much more. In addition, Brownstoner reported at the time that Arthur planned to cap it all off by creating a huge whale out of an old helicopter and hanging it from the building. 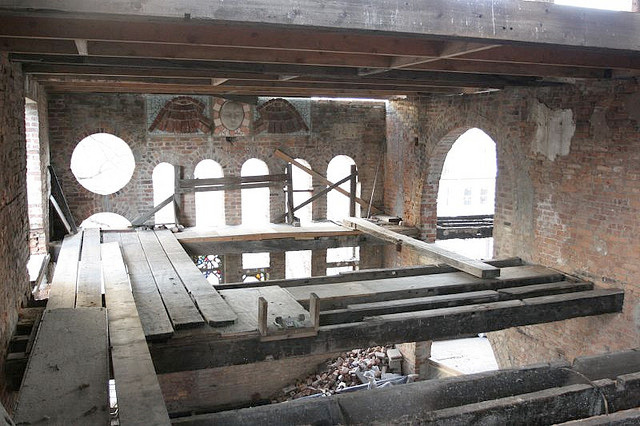 After the fire, Christopher wrote, “Many of you wonder what the hell my parents are doing with that building. They have always been building an outline of a dream.” Sadly, as with most dreams, the reality was not to be. There followed three years of complicated legal and financial troubles, with defaulted loans, broken trust, unkept promises, and money gone missing. Shahn and Arthur went from collaborators to litigious enemies, and the property was foreclosed upon by the lender, Madison Realty Capital, in 2009. 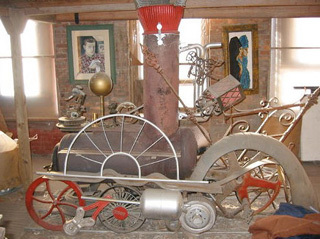 By then the Broken Angel had been mostly gutted, the majority of its superbly unique elements removed. Shortly thereafter, in 2010, Cynthia lost her long battle with cancer. Arthur has been in and out of the building ever since. Now the city has given Arthur one more final notice, so barring another stay of execution, March 30 will be Arthur’s last day in his home of nearly thirty years. The eviction date was originally set for today, March 15, but yesterday the city postponed it without explanation, according to the aforementioned Daily News article. This likely has something to do with the massive outpouring of community support the project has received over the past week — a goodbye block party tonight, which was originally organized as a small, ten-person gathering, has ballooned to an enormous, two-part spectacle, with over 900 people planning to attend. The festivities will begin outside the house itself (4–6 Downing St.) for a family-friendly fête, and will then move to the Irondale Center for a fundraiser-turned-Brooklyn-underground-extravaganza, filled with dancers and performers and DJs and surprises. Kerner, one of the event’s organizers, says they chose to have a block party to give people a chance to say farewell to Broken Angel, “to wish Arthur well and maybe sing him a song or dance him a dance or do something to show their support of the situation. They could bring all their favorite memories of the space, shake his hand, share some cookies …” Chris has said that they would like to put together a time capsule to hide in the building, so people can bring something small to contribute to that. Ever hopeful, friends have put out an open call for (pro bono) legal help (contact [email protected]), and a donation page has been set up in the hopes of raising $50,000 to keep fighting. So this could really be the end of Broken Angel, but people have been saying that for nearly a decade, if not longer. Arthur is old now, and tired, but he’s still feisty, and he has support from many different corners. And after all, for someone who created an unbelievably unique structure out of salvaged bottles and boards, would it be so unreasonable to hope for a few more years to keep creating amazing art within it? The Broken Angel Eviction Block Party will take place tonight, March 15, beginning at 4 pm at house (4–8 Downing Street, Clinton Hill, Brooklyn). More information can be found here.